There are lots of scenic and fun attractions between Queenstown and Wanaka. After spending a day and a half in Queenstown, it was time to hit the road. Justin and I had a rental car with a tank full of gas, and we were ready to embark on our epic road trip of New Zealand. Starting in Queenstown, we’d eventually drive all the way up to Auckland (with one ferry ride between the South and North Islands). Whether you’re making the drive to Wanaka like we did or you’re looking to take day trips from Queenstown, enjoy the spectacular natural scenery and history of New Zealand through this outing. 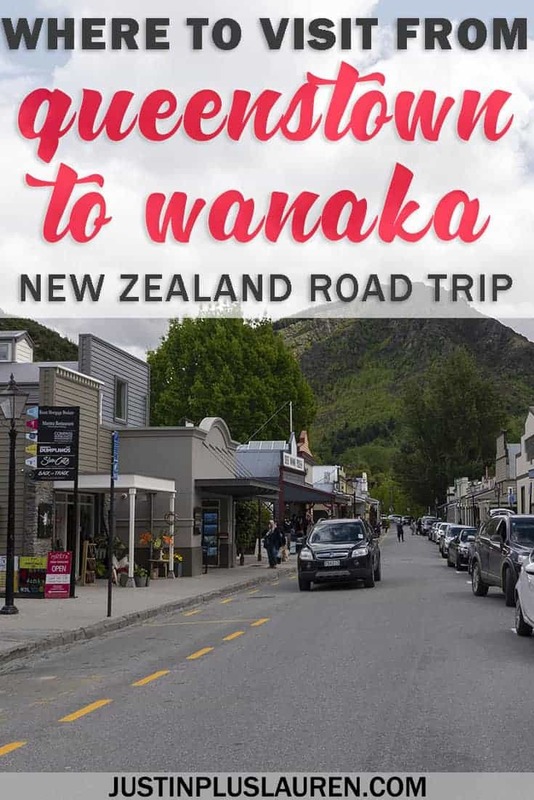 While there are several Queenstown day trips you can take if you decide to base yourself in the town (Glenorchy being one of those, or even Milford Sound), this is the route we took to travel from Queenstown to Wanaka. 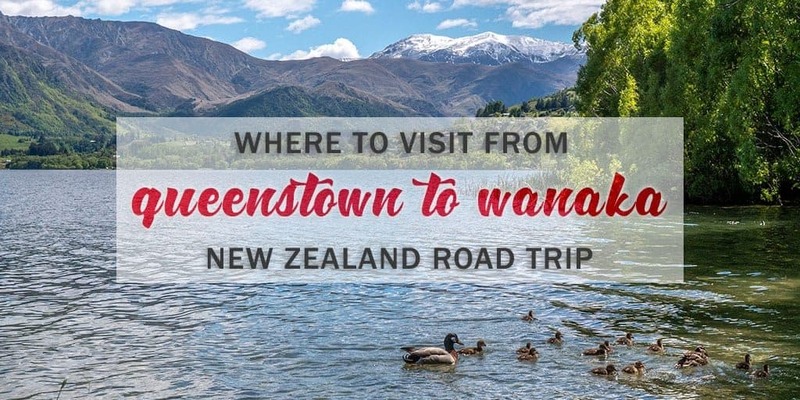 Naturally, you can follow this same route if you happen to be traveling in the opposite direction from Wanaka to Queenstown (just do everything in the opposite order to what I’ve listed). 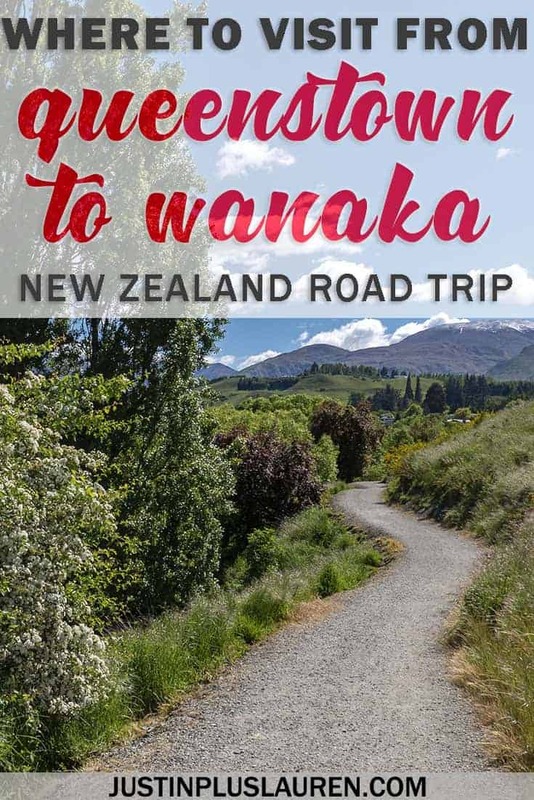 For those who would like to see this itinerary put into action, please check out the following travel video, highlighting these day trips from Queenstown. 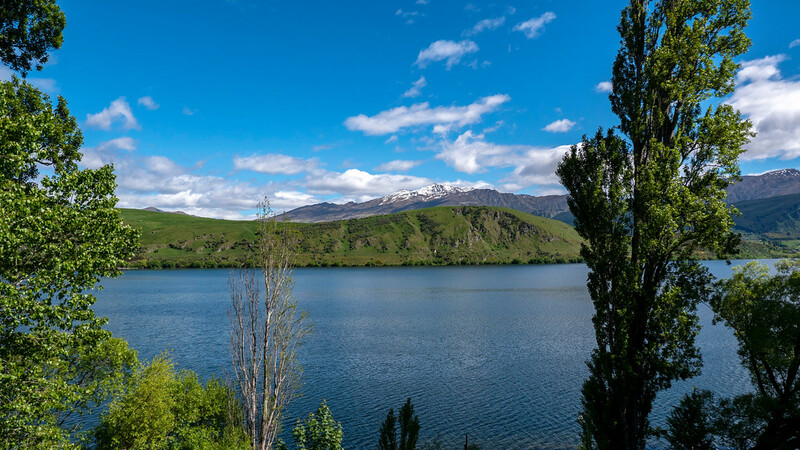 You’ll see Lake Hayes to start, followed up by our afternoon in Arrowtown. I decided to try my hand at panning for gold. 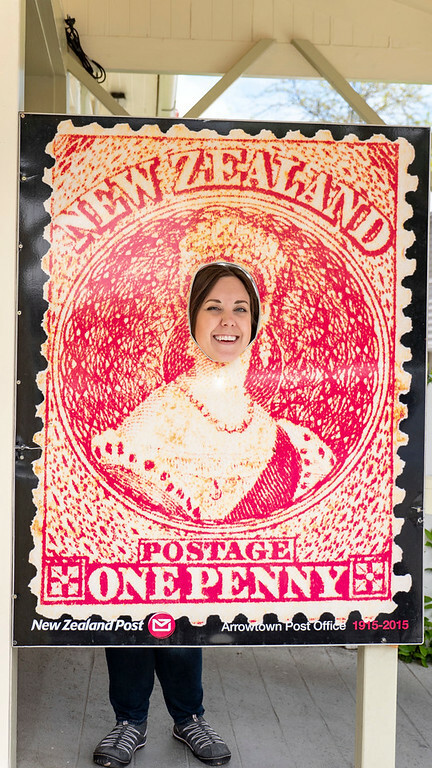 Did our trip to Arrowtown make us rich? Lake Hayes and the Lake Hayes Walkway is about a fifteen minute drive from Queenstown. 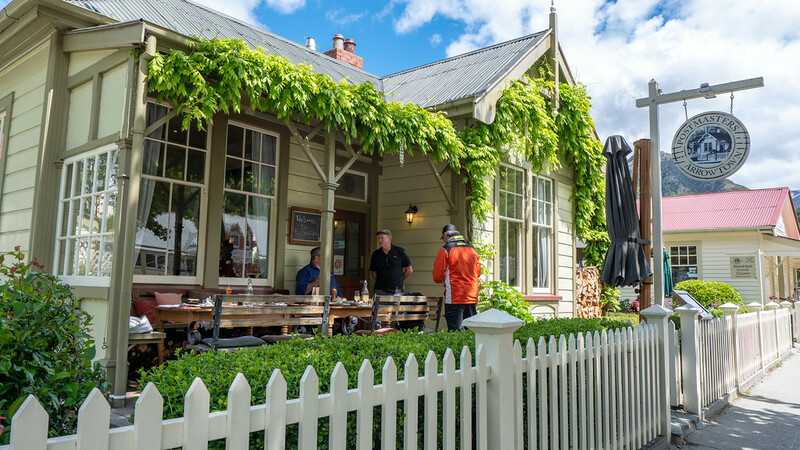 It’s the perfect first stop for your drive from Queenstown to Wanaka. 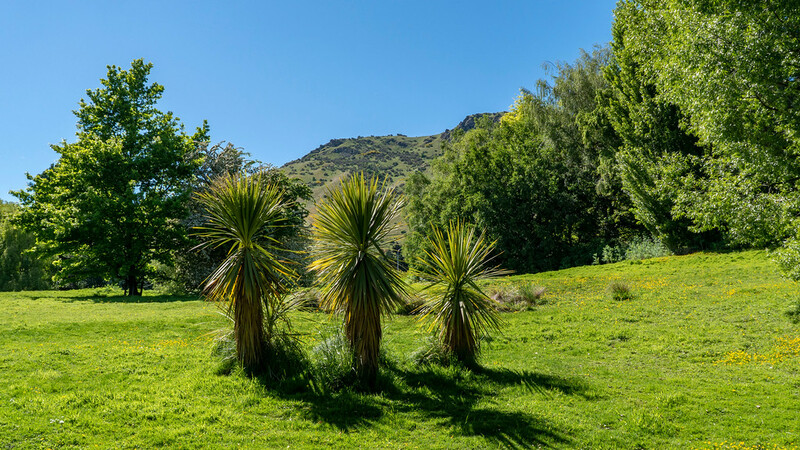 It’s also an ideal outing if you’re planning any day trips from Queenstown. 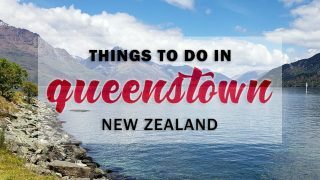 As it’s only a short distance away from Queenstown, feel free to incorporate it into any Queenstown itinerary if you’re looking to explore the great outdoors. 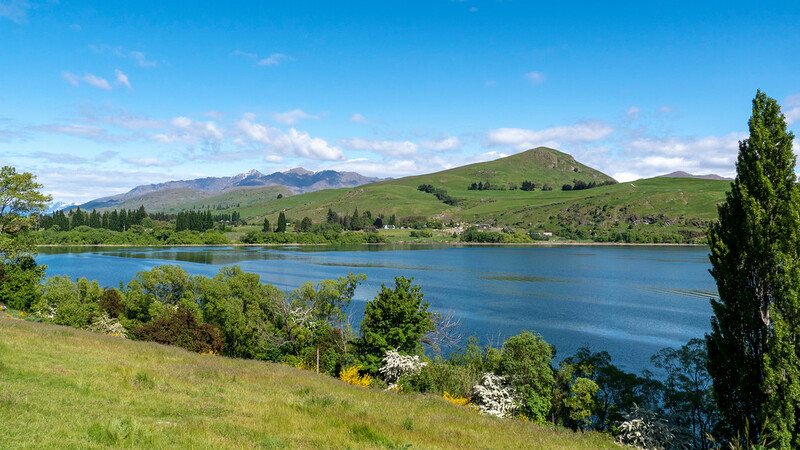 Lake Hayes is a small lake, and it takes around two or three hours to completely walk around it (the loop is 8km in total). It’s a multi-use path, meaning that you can walk, run, or cycle it. No matter how you choose to enjoy it, you’ll witness incredible views of spectacular mountains off in the distance. 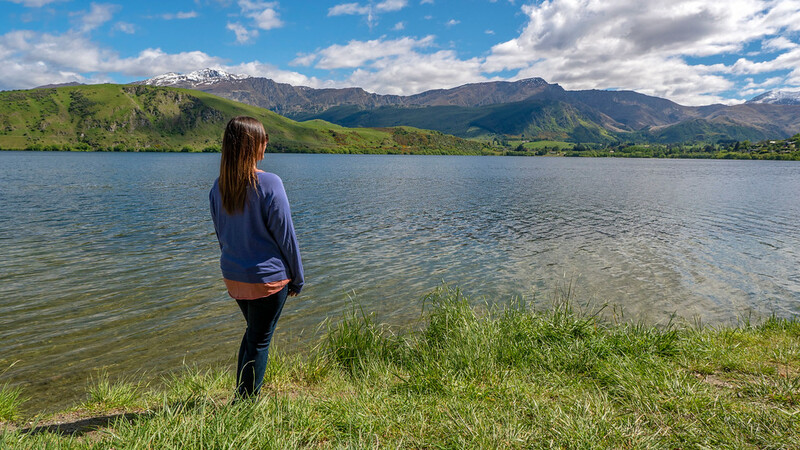 At times, Lake Hayes can be quite reflective. Unfortunately, when we visited it was a little too windy, so the mountains were not reflecting in the water. You might have better luck than us! 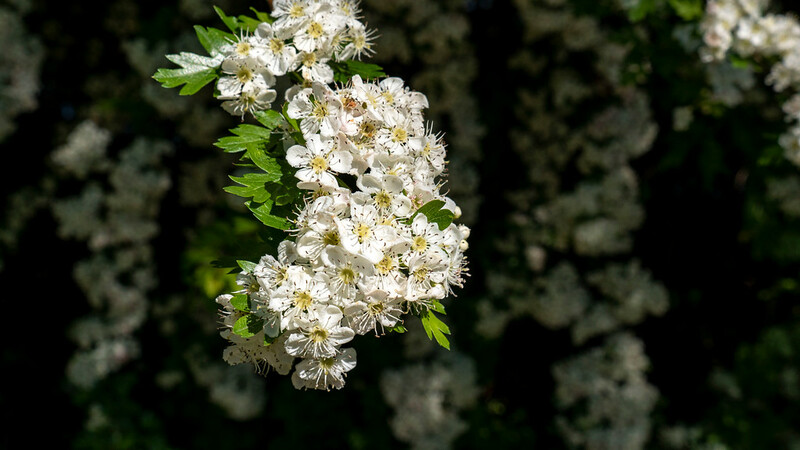 When we visited in the spring, many flowering trees and bushes were coming into bloom. There were families of ducks with their babies paddling around the lake. 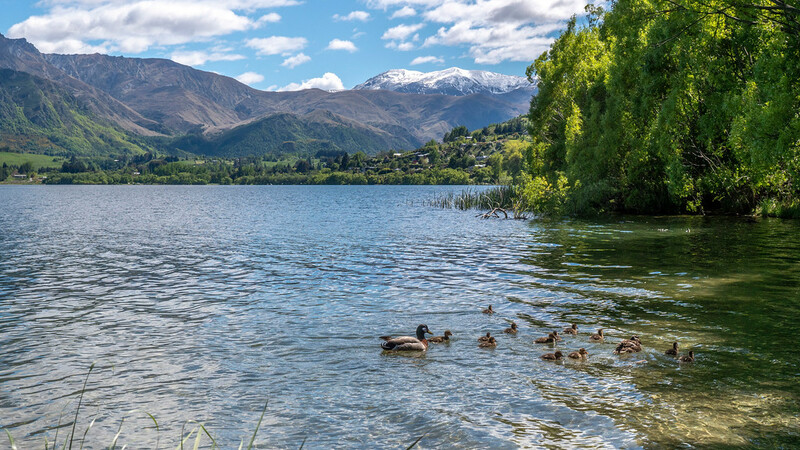 Apparently, Lake Hayes is also home to a healthy population of Australasian crested grebe. To get there, take Highway 6 driving northeast out of Queenstown towards Lake Hayes. Near the lake, you’ll see a small parking lot where you can park. 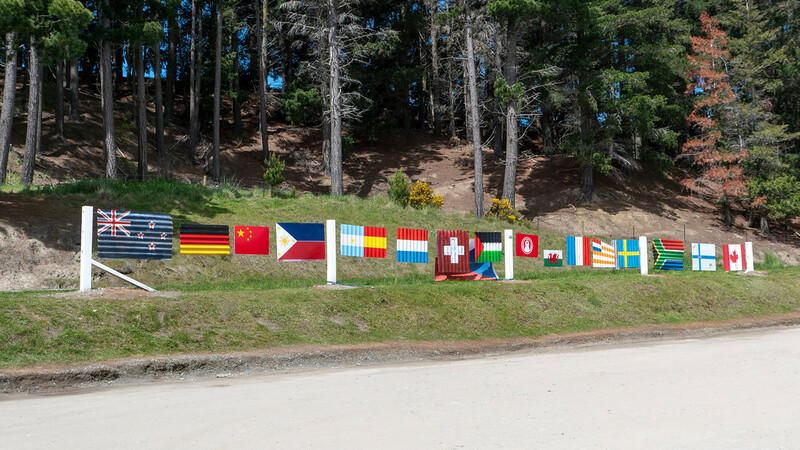 It’s right at the Lake Hayes Pavilion (you’ll see this marked on Google Maps). If you continue driving for another five minutes or so from Lake Hayes, you’ll drive right into Arrowtown. 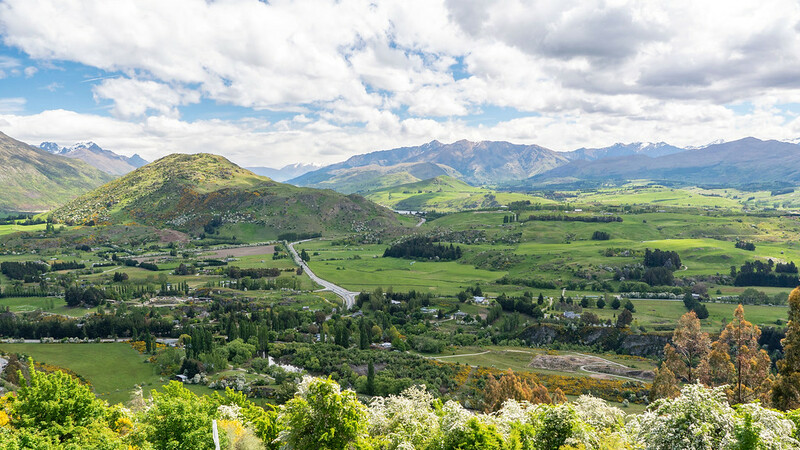 To get from Queenstown to Arrowtown, the drive is approximately 20 minutes. 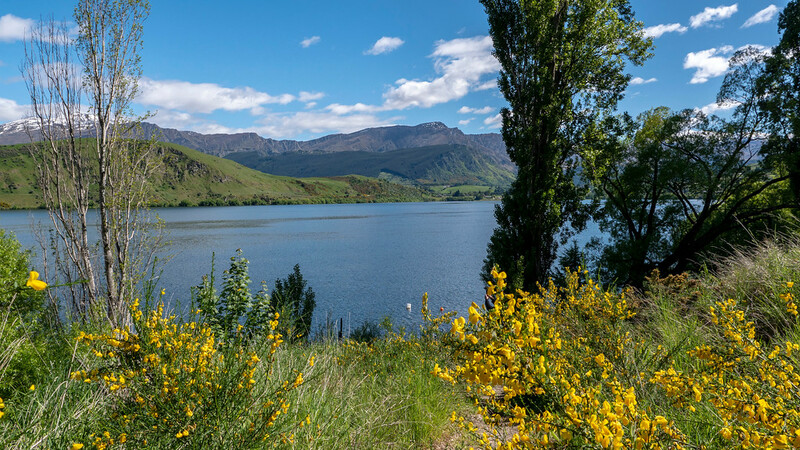 Both Lake Hayes and Arrowtown are perfect day trips from Queenstown, and you’re able to see both in as little as half a day. 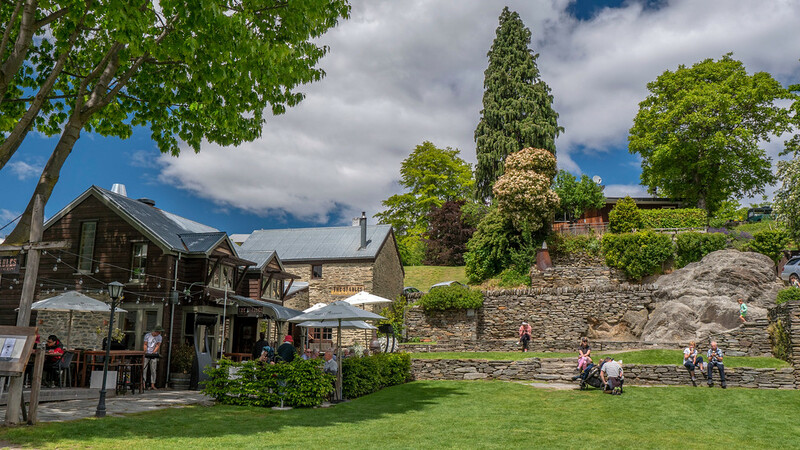 Arrowtown is a historic gold mining village dating back to the mid-1800s. 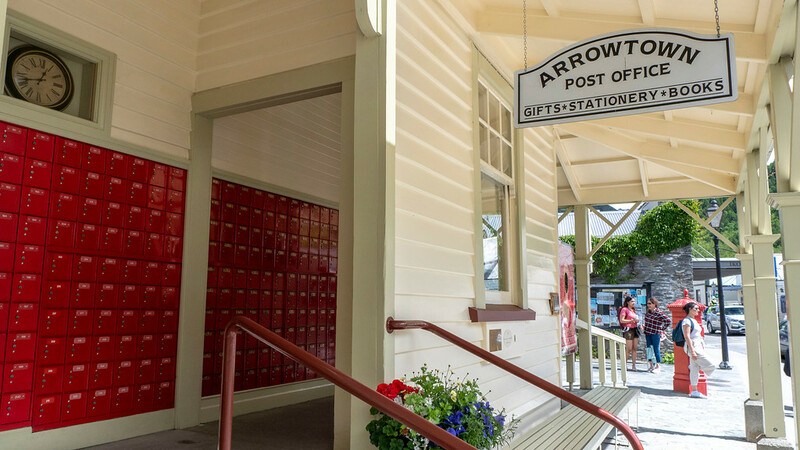 Built on the banks of the Arrow River, Arrowtown has many perfectly maintained original buildings that certainly add to the town’s charms and quirks. 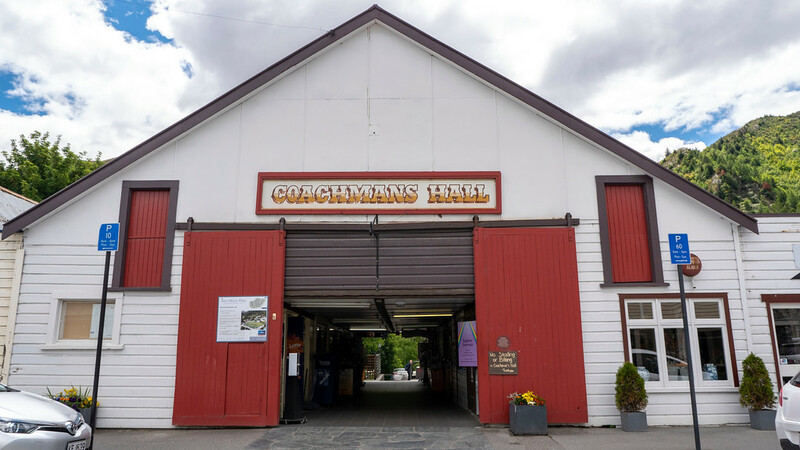 In 1862, thousands of miners raced to Arrowtown, completely taken by gold rush fever. 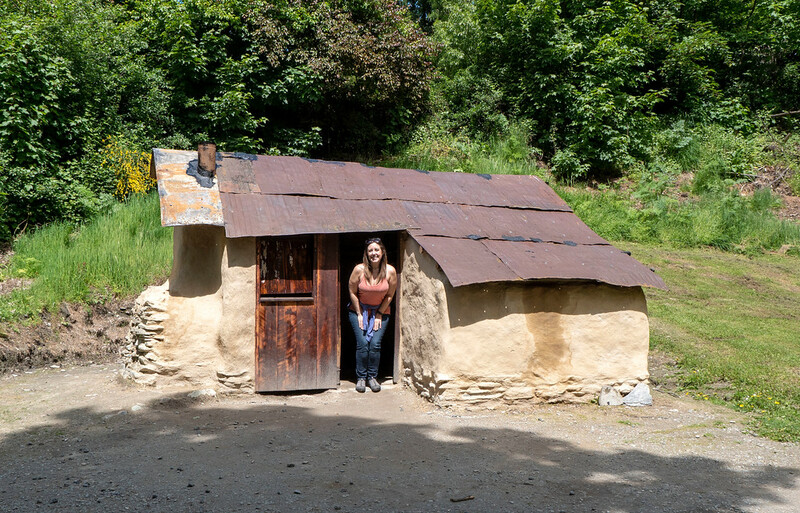 Even though the miners have long departed, their stories are preserved in local museums and landmarks. 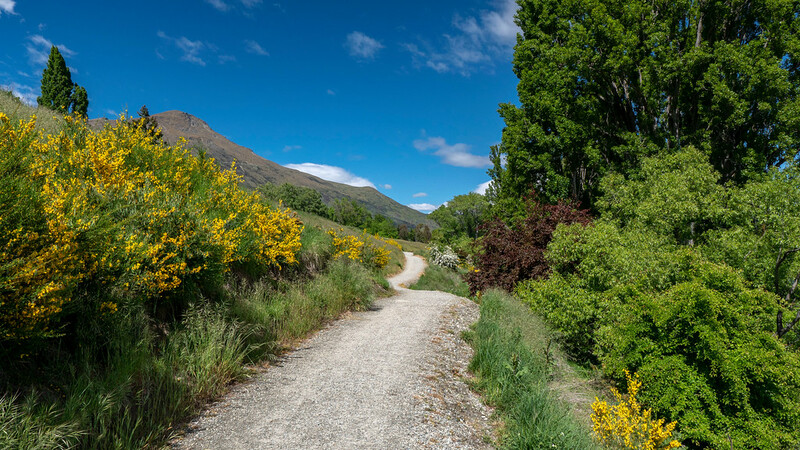 Here are some of the best things to do in Arrowtown, New Zealand. 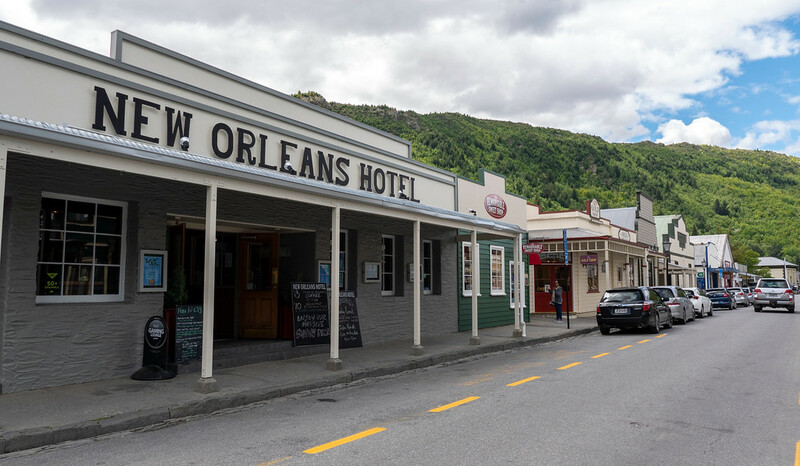 Walking down the main street of Arrowtown New Zealand, it’s a delight to see the maintained buildings from the 1800s put into new use today. Nowadays, they’re restaurants, souvenir shops, cafes, and even a little post office. 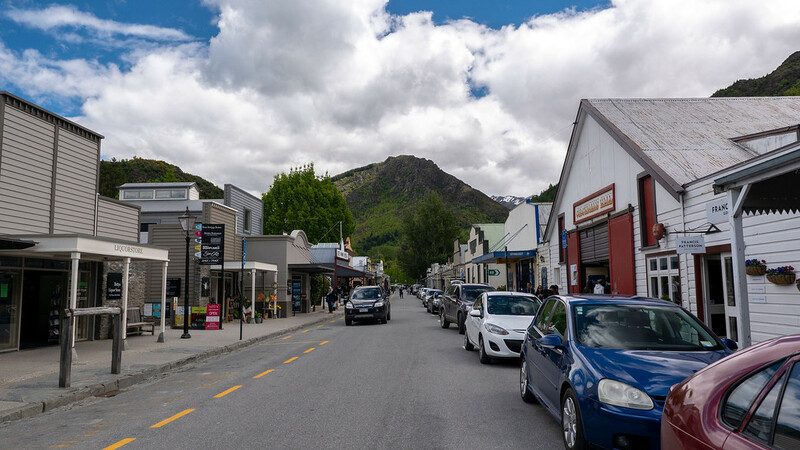 Although it’s a popular tourist destination, around 2000 people currently live in Arrowtown and go about their daily lives in this charming little village. 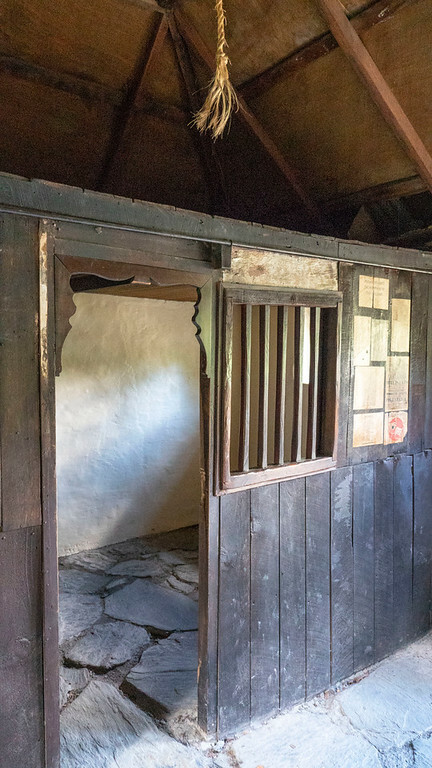 Alternatively, the Arrowtown Chinese Settlement offers an entirely different perspective from the days of the gold rush. While the European settlers lived in cottages surrounding the photogenic main street, the Chinese miners were forced to live in modest huts down by the river. 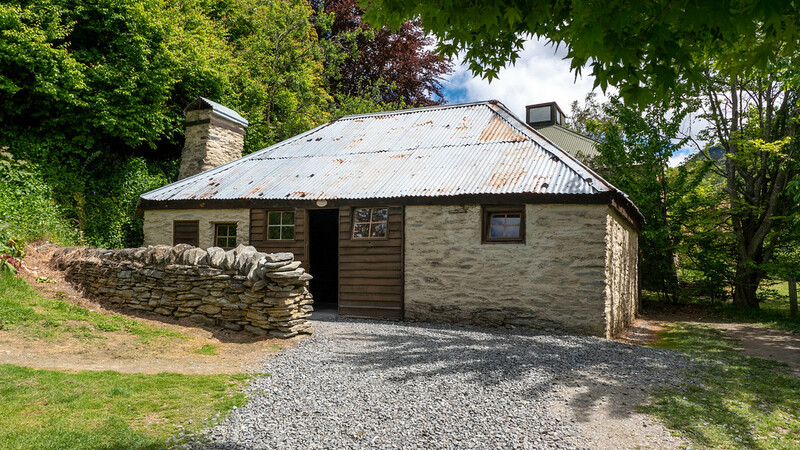 By 1874, there were over 3500 Chinese workers living in Arrowtown, and they faced a lot of racism and intolerance from the locals. 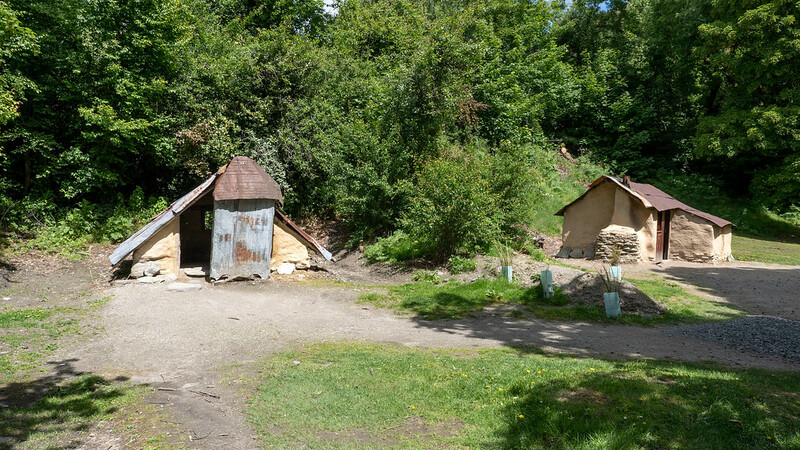 Their tiny settlement became its own isolated community. 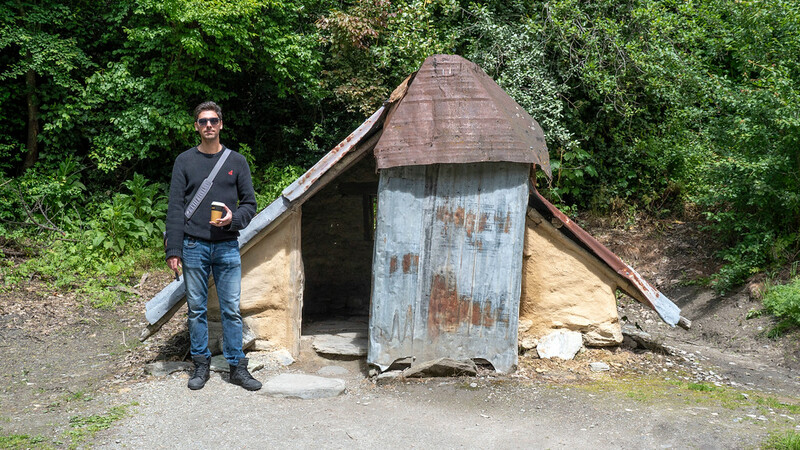 By contrast to the beautiful buildings in town, we can see the harsh conditions that the Chinese miners faced while wandering around their restored huts. There are many plaques detailing the issues that the Chinese people faced in this community. It’s very interesting and definitely worth a visit. 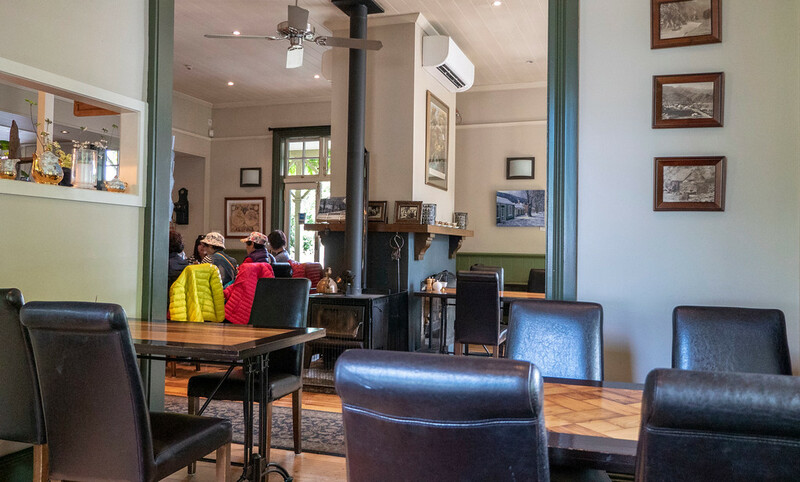 Postmasters Restaurant is a popular eatery inside a preserved cottage from the 1860s. 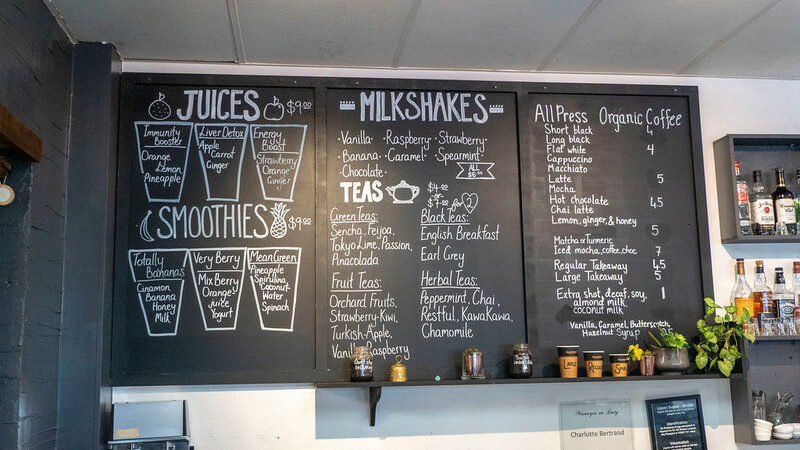 They serve up breakfast, lunch, and dinner with a focus on fresh and local ingredients. The menu highlights seasonal dishes, including vegetarian and gluten-free options. There were no issues ordering vegan meals here. Right on the menu itself, Postmasters states that they have vegan, gluten-free, and dairy-free meals. I ended up ordering a falafel burger with fries. This one wasn’t listed on the menu, but our server said that the falafel appetizer could be made into a burger. Justin got some gluten-free bread with an assortment of dips and spreads (avocado, hummus, olive oil), as well as some olives. Postmasters also had vegan cake available, but I was far too full to order any this time around. 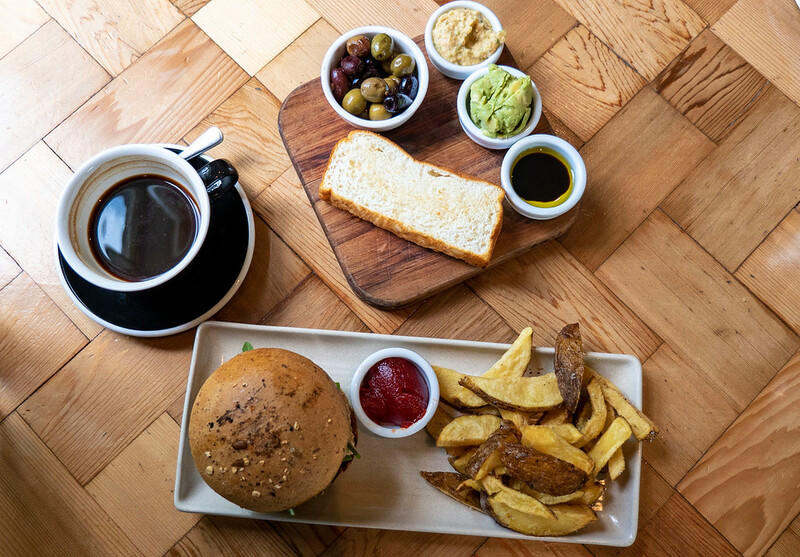 Looking for vegan food in Queenstown? 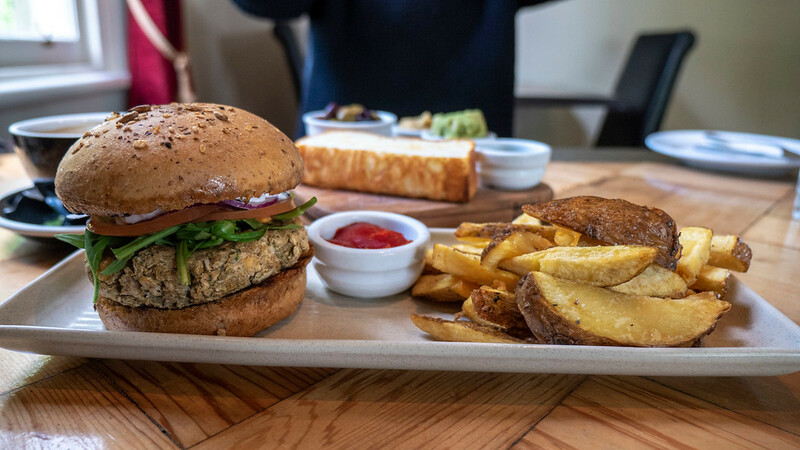 Check out our vegan Queenstown dining guide! After you wander through town, you’ll want to take a stroll down by the river. 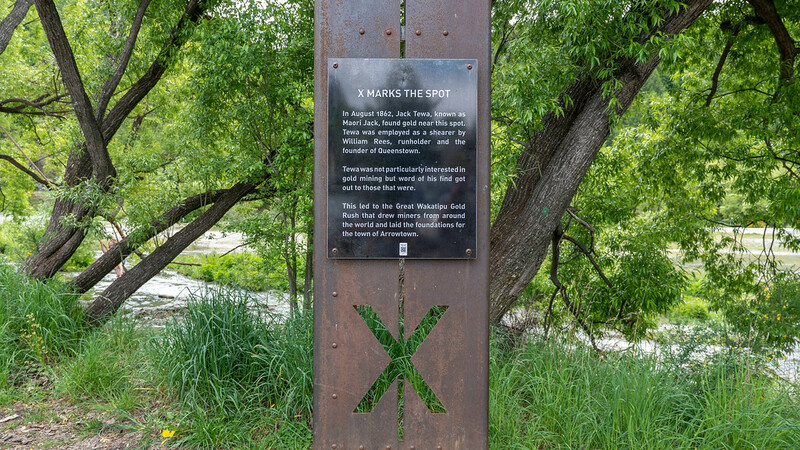 There’s a sign post with a plaque on it called “X Marks the Spot.” It’s the original place where Jack Tewa (Maori Jack) first stumbled upon gold, which eventually led to the gold rush. 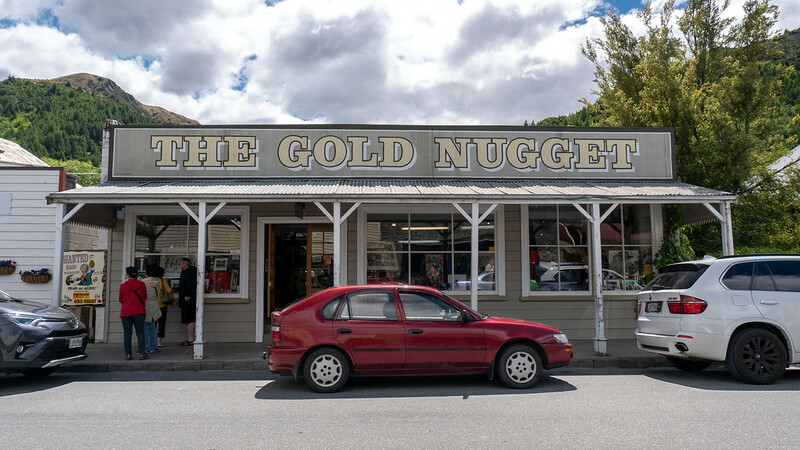 While Jack wasn’t particularly interested in finding gold, this discovery had people from all over the world flocking to Arrowtown seeking gold. 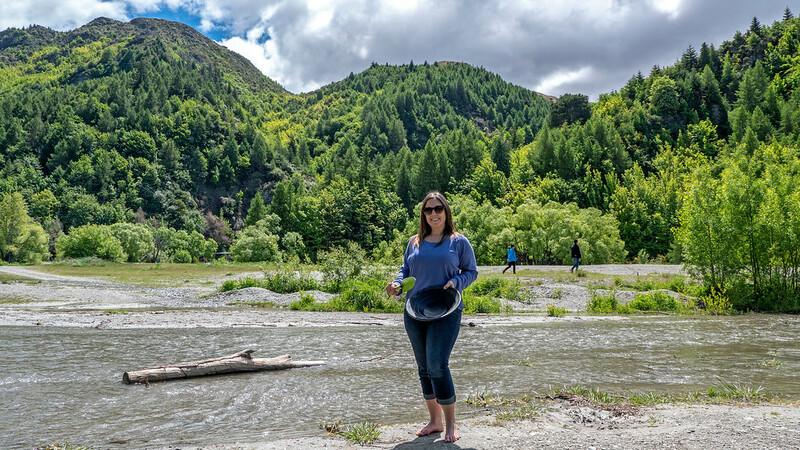 I really had no idea that I’d end up panning for gold myself while visiting Arrowtown! We happened to see a sign advertising that you could pan for gold, and we might have seen another tourist doing it. 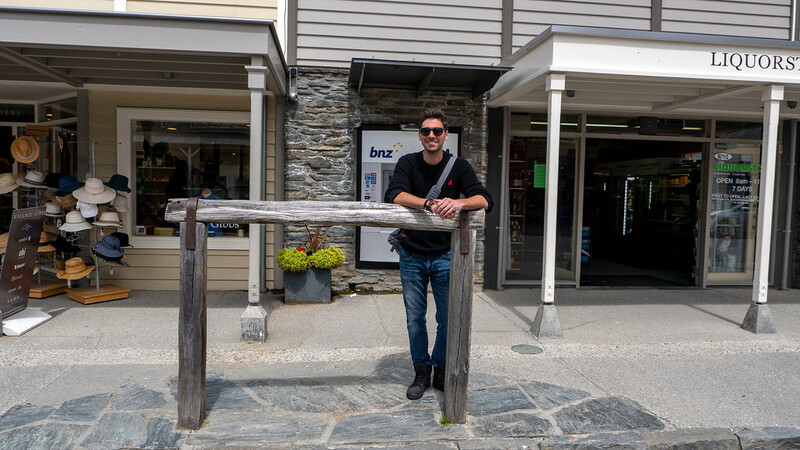 I thought, well, when in Arrowtown! Where else would I end up panning for gold down by the river? You can rent gold panning equipment for $3 (plus a $10 deposit), which is essentially a pan and a small shovel, from the Lake Districts Museum. From there, we walked down to the river and I gave it a shot. Panning for gold is a lot harder than it looks! While the rental equipment came with a set of instructions, I was having absolutely no luck. I’d pull up lots of rocks and gravel, but there weren’t any bits of gold from what I could see. However, apparently there’s still gold in the Arrow River, so perhaps you’ll have better luck than I did! What would a day be without coffee? I don’t even want to know. 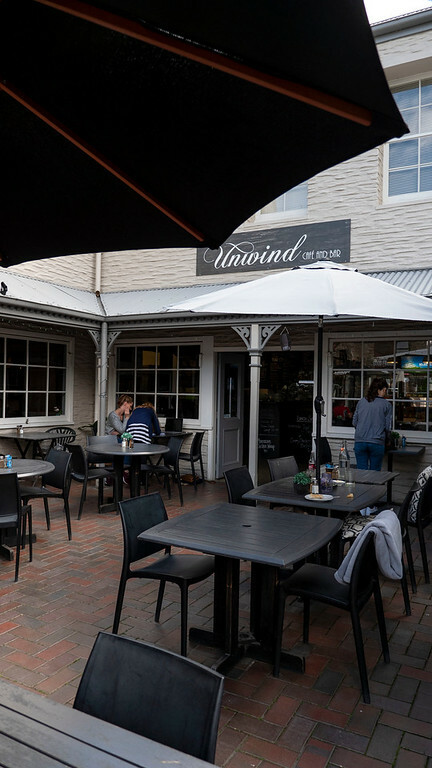 Before heading out of town, we stopped for a coffee at Unwind Cafe, just off the main street. There’s a really nice patio out front, and the cafe itself is quite cozy indoors. They have all kinds of caffeinated beverages, but I stuck with the basic long black. Oh yes, you don’t want to order an Americano in New Zealand! 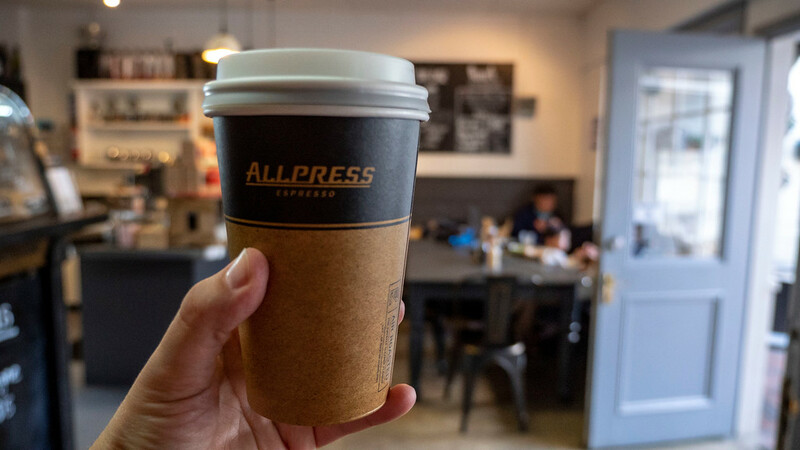 When I first arrived at the Auckland airport and ordered an Americano, I listened to the barista complain that I ordered an Americano as opposed to a long black (not knowing that I was standing right there, hearing the whole conversation). I learned quickly that the two beverages are quite similar, no one orders an Americano in New Zealand, and a long black is what I desired. Anyway, Unwind Cafe makes a pretty awesome long black, so I highly recommend that you get your coffee fix there. 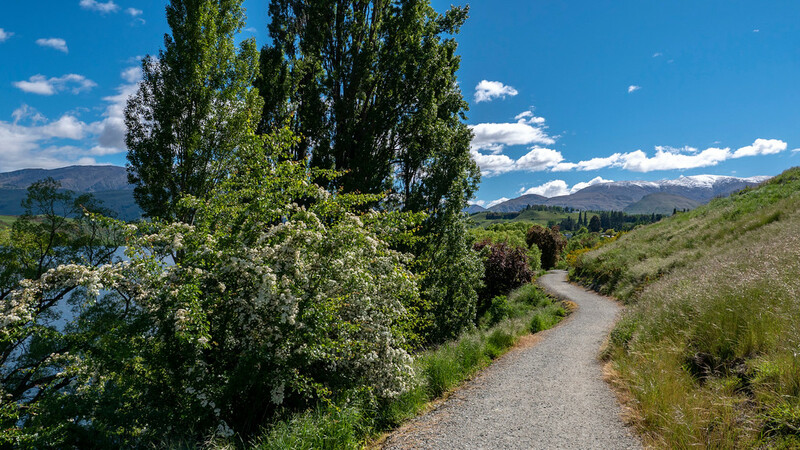 Check out all of our photos from Arrowtown by visiting our travel photography album. You can purchase photos, canvas prints, housewares, phone cases, and more – all created from any one of our travel photos. 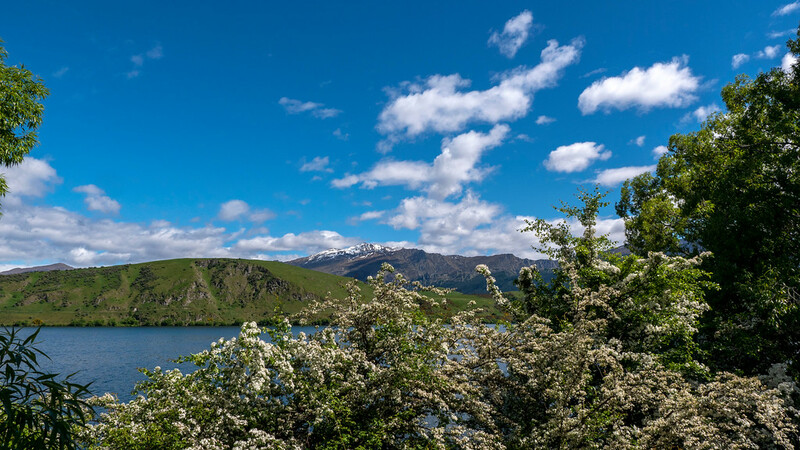 The rest of the drive from Arrowtown to Wanaka is quite scenic and stunning. 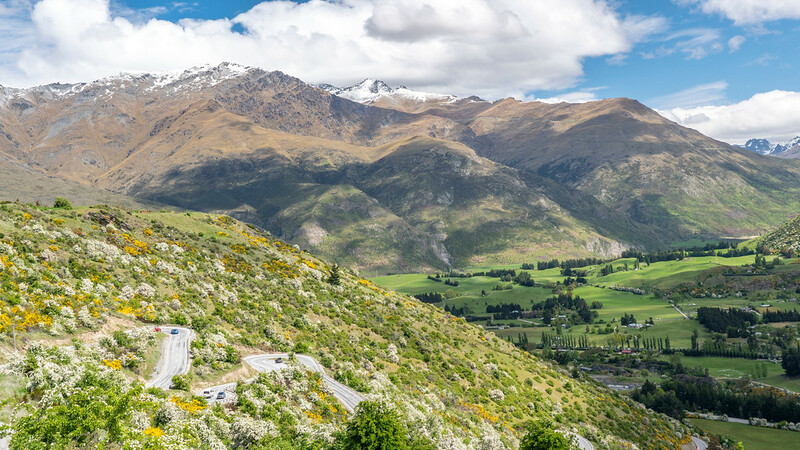 The roads start to wind up the mountains as you drive towards Cardrona. There are several scenic lookout spots where you need to stop the car. The Arrow Junction lookout point is the first one you’ll come across, offering unbelievably beautiful views over the countryside. You’ll even see Lake Hayes off in the distance. The Crown Range Road scenic lookout is the second spot at the side of the road where you’ll want to take a look. Both of these areas have parking lots where you can safely leave your car while you admire the view. 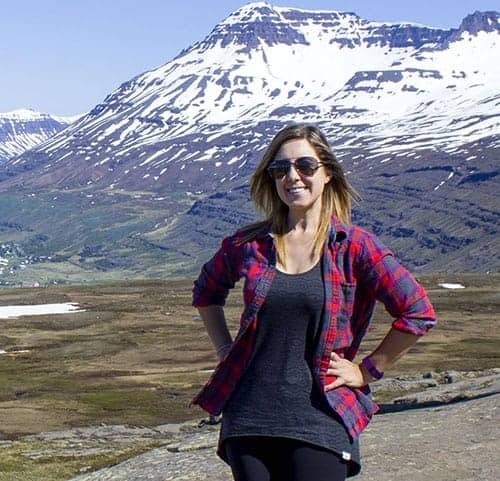 The panoramic scenery of the towering mountains is quite spectacular. 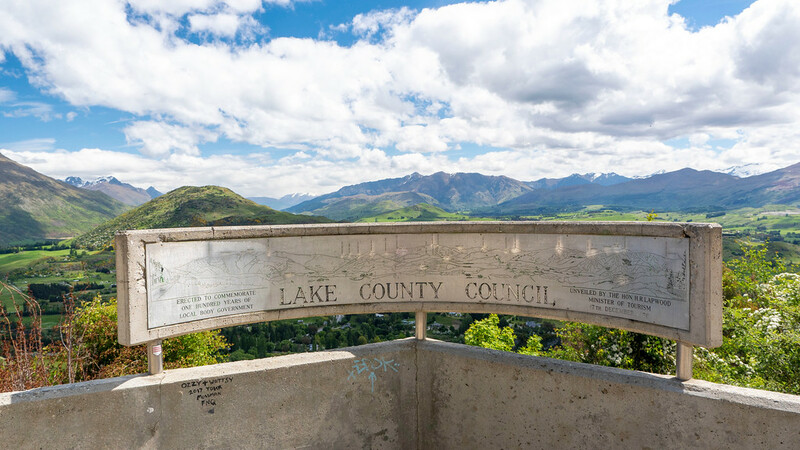 You can easily find the Arrow Junction lookout point and the Crown Range Road scenic lookout by inputting those into Google Maps, though you’ll spot them without any trouble on your drive. 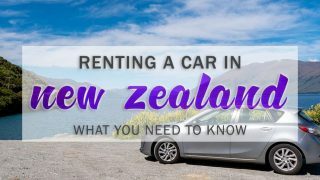 If you don’t have your own rental car and you’re staying in Queenstown, don’t worry at all. 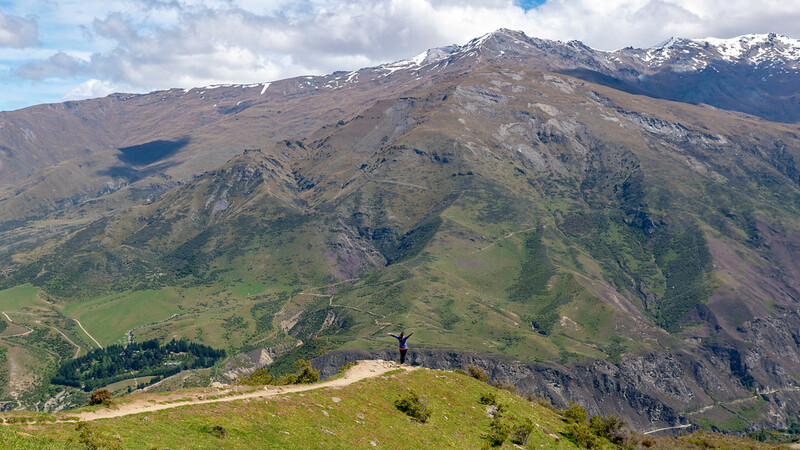 There are lots of tours that travel outside of Queenstown so you can have similar experiences. 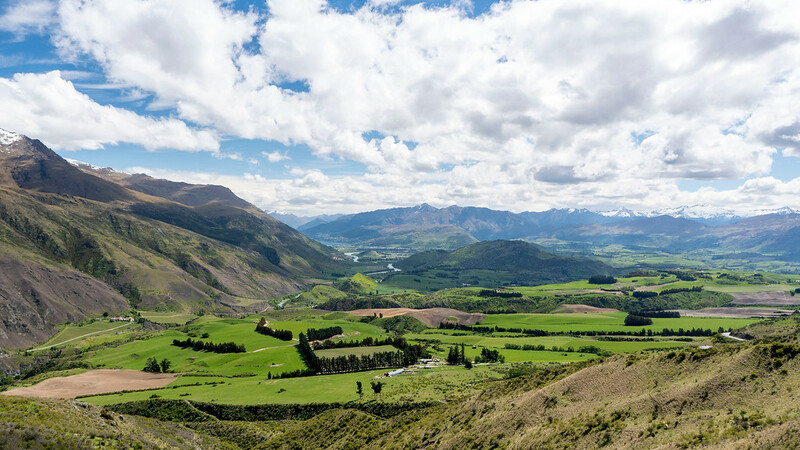 Check out this tour that allows you to witness scenic sights, as well as pan for gold in Arrowtown. 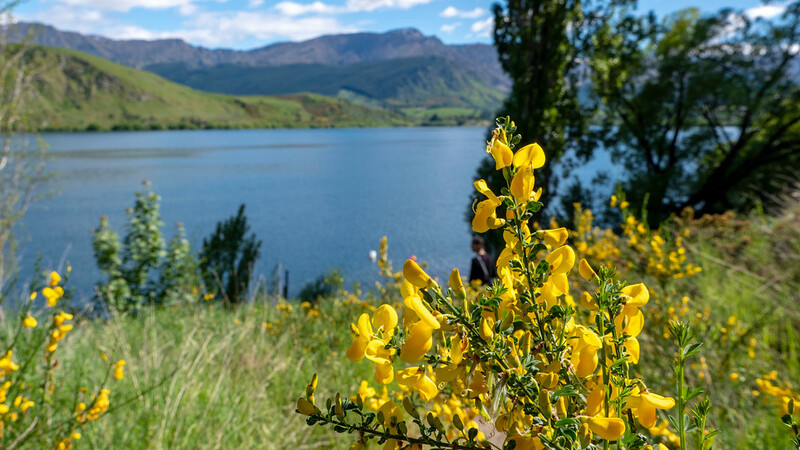 This tour takes you on a guided hike near Queenstown, most likely to Lake Hayes, along with afternoon tea. 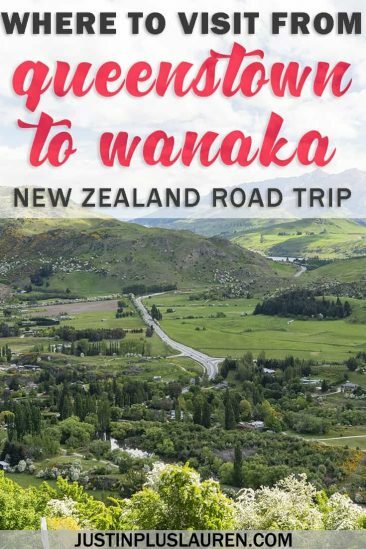 Furthermore, this scenic tour goes to Arrowtown, the Kawarau Bridge, and one of the southernmost wineries in the world. 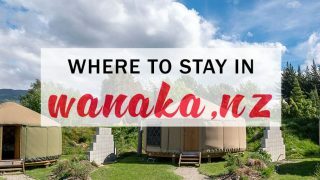 Once we arrived in Wanaka, we spent two nights in a yurt accommodation that was a really awesome experience. Oasis Yurt Lodge is a unique accommodation where you can find peace along your hectic journey. 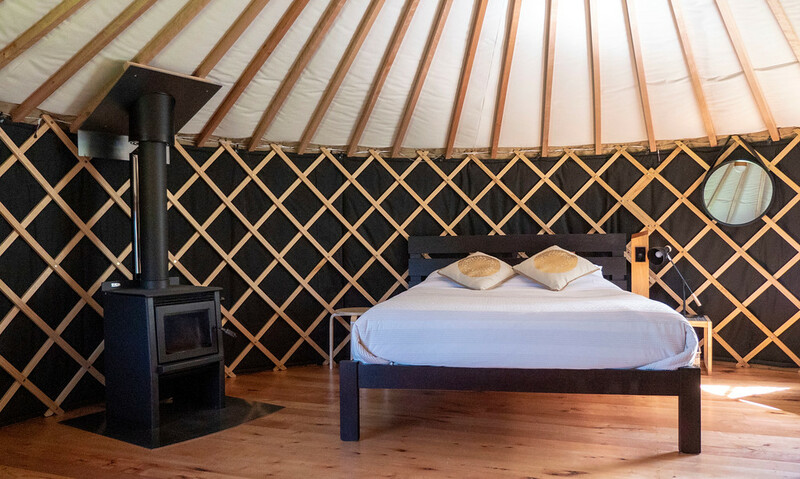 These yurts are more luxurious than typical glamping in New Zealand. Every yurt has power and lighting, so you’ll be able to charge and use your electronic devices. The beds are very comfortable for a cozy and restful night’s sleep. There’s a massive shared kitchen where you can prepare all of your own meals, too! Justin and I wished we could have stayed even longer at Oasis Yurt Lodge. 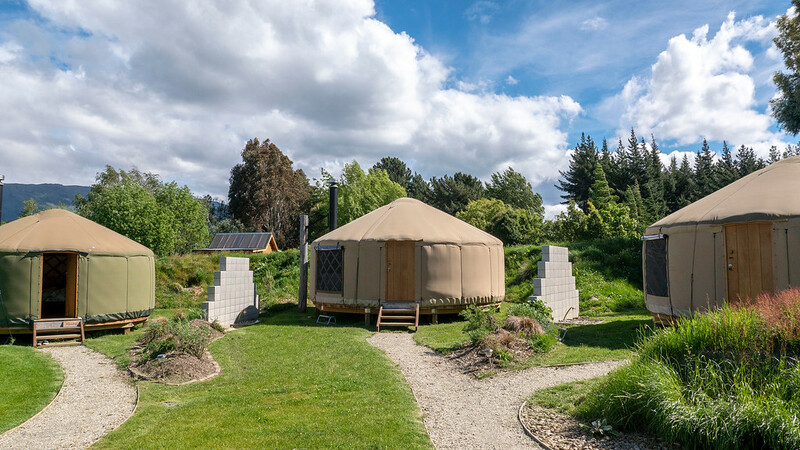 This luxurious yurt combines modern amenities with a peaceful environment, along with spectacular views at the gateway to the Southern Alps. Unwind in style at Oasis Yurt Lodge for marvelous memories that will last a lifetime. 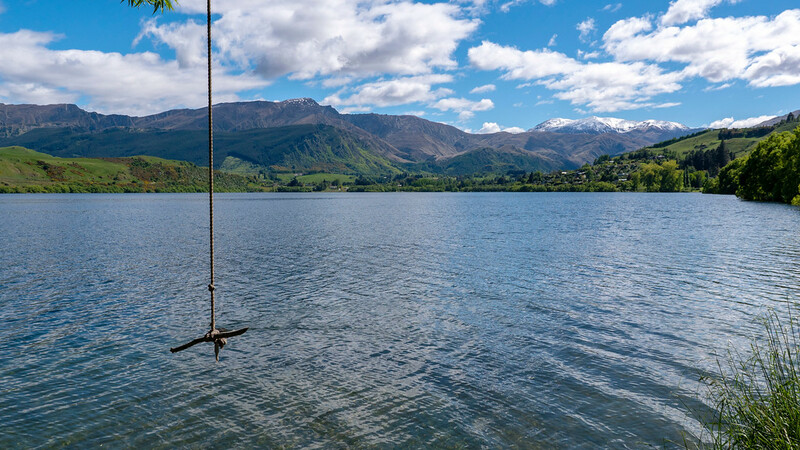 If you’re looking for where to stay in Wanaka, this is our #1 recommendation. We can’t wait to someday return to Oasis Yurts in the future. Click here to book your stay at Oasis Yurts or check out more reviews by fellow travelers. Which day trip from Queenstown would you most like to do? Check out our other blog posts to help you plan your dream vacation! 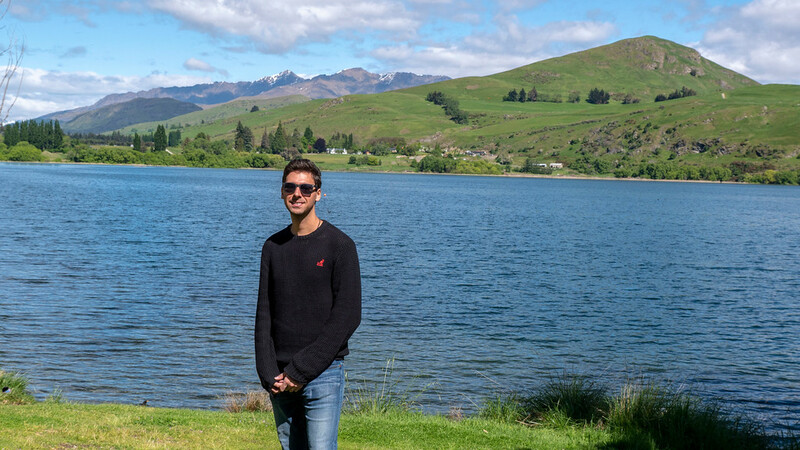 Check out the best way to spend a day in Queenstown, New Zealand. 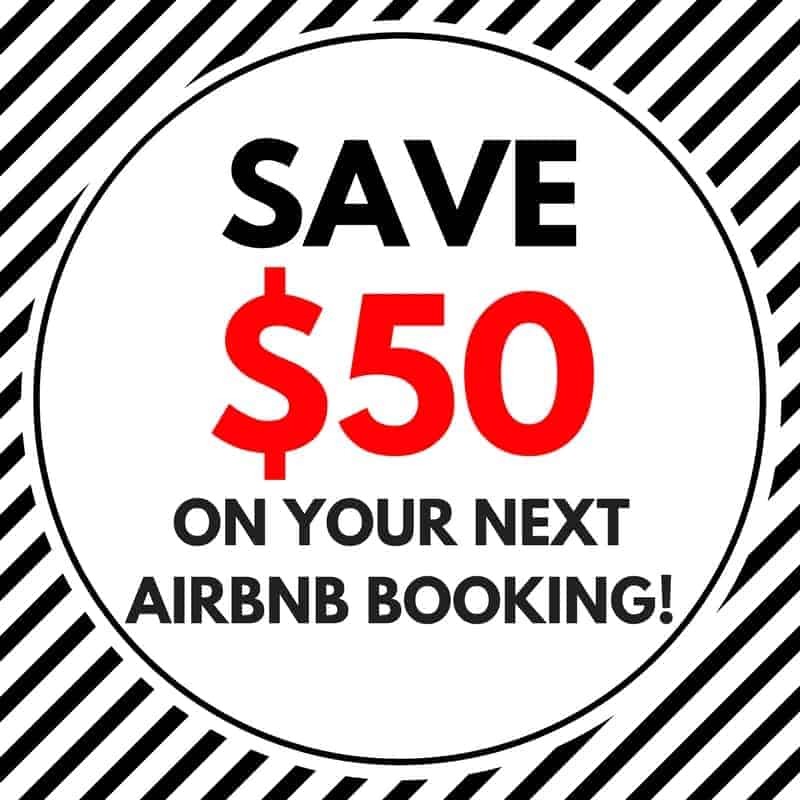 Don't miss this helpful guide with all you need to know! 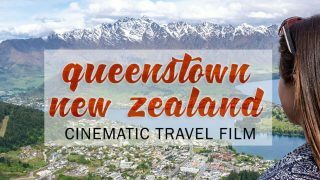 This cinematic video from Queenstown will surely inspire your trip. 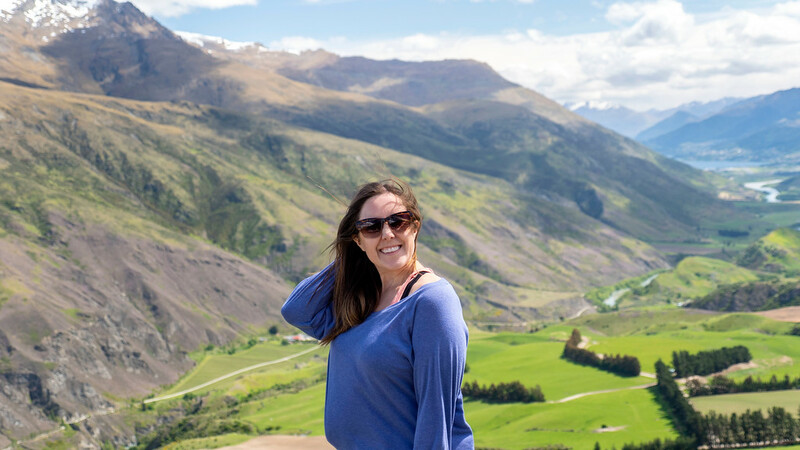 Staying in a yurt in Wanaka made for a memorable holiday.